I'm almost 1/2 through the alloted yarn for the Misty Garden Scarf...the second skein is wound. I think I need to pick more knits like this as it's been a breeze. 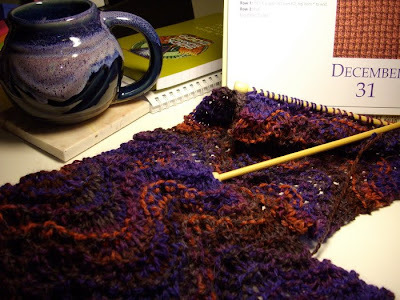 The pattern is one I memorized years and years ago (Feather and Fan or Old Shale) and I just knit along one repeat at a time. Charity knitting was down as well, although I was able to finish the Homespun Shawl I'd started 5 years ago and gift it at NoSoKnit in September - that was yet another item in the Basket of Shame (BOS)! It felt REALLY good to finish that. Otherwise? The Log Cabin Blanket is still OTN - it will become one of my BOS items for 2010, but more about next year, later (tomorrow!). The biggest item I wanted to accomplish was my knitting room/office. I failed miserably until about a week ago, when I spent a day working hard at it. It's half done. Perhaps I'll have a weekend to work on the other half soon - in January - because most of that corner of the room is related to my consulting work, and of course, it's time to organize a year's worth of data and put it away to start the new year, so there's HOPE! Now...I had a nasty little accident last year on this day...was Forester-less for a month, remember? Last night? I fell hard on the ice at a local restaurant. I'm heading to the doctor today, as I'm definitely all banged up and hurting badly. (But I'm walking and that's really a good thing!) I'll let you know how things go, okay? With a little luck it will just be good and sore and bruised for a bit. I might as well get comfortable, she's going to be up late tonight, she says, to watch that ball drop. 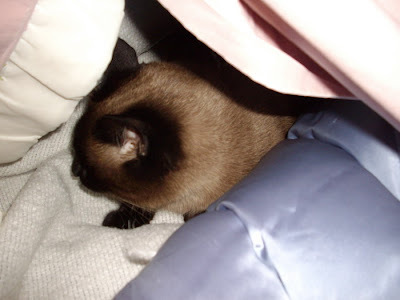 I hate the noise they make when they do, so I'll stay somewhere safe! Sometimes, I want to say "and good riddance" at the end of a year, and this one comes pretty close to that in many respects. What a time we've had! While I can't say it was the worst year of my life, it was certainly challenging in many ways. But 2009 was a good year, too (and you know, I think mostly that's true of them all, some good, some bad...) - if only because there was progress on a long-held desire of mine to once and for all lose weight. Personal change comes slow to me. I guess I have to think on it for years to come to the decision that what hasn't been working has to change. Sometimes a slap in the face (figuratively, of course) wakes me up, and sometimes, it's just a gradually increasing frustration with myself for not taking action sooner. Where my weight was concerned? I guess it was a combination of both, and perhaps to have any kind of lasting success, that's what I needed. With a little luck, and some tracking and planning, I'll hit my mini-goal of 20 pounds lost by the first weigh-in of 2010 on Tuesday next week (there was another 2.2 pound drop last night, so it's not too far-fetched to think I'll reach it). Stay tuned. But spending the past 3 months learning the drill at Weight Watchers and seeing the numbers tick downward on the ticker up there (or rather, upward, as I'm tracking the pounds LOST and they're increasing!!!) has been rewarding. What worked this time was knowing that I was doing this for myself - not to look better, not to be prettier, not to fit into a dress, not to meet a goal of some date like a reunion where I wanted to wow someone, and certainly not "for" someone else. I am doing this because I have felt rotten for too long. When I got the diagnosis of degenerative disc disease, I realized that there was no one else to blame...and while that couldn't be corrected, I could take steps to minimize the discomfort (and sometimes outright pain) and perhaps slow any worsening of it. You know? Perspective is extremely important in making the decision to make changes in your life. It was the same thing when I quit smoking: I had pneumonia (a particularly bad case of it). I couldn't walk from the living room couch to the kitchen (about 20 steps on level) without gasping for air. And the sudden thought came to me: "This is what heart failure feels like." Having survived a heart attack? That meant something to me...and mind you I didn't quit smoking that day. I got better (amazingly, now that I think of it, I smoked the whole time I had pneumonia!!) and I considered and explored treatment options and about 6 weeks later I quit. For good. It'll be six years in February 2010. So. With that success under my belt, I knew that eventually I'd do something about my weight, but again, it took a health "crisis" to motivate me. The reality is? We don't react the same way someone else does. What motivates me won't necessarily work for you. And the methods I use won't always be the right ones for you, either. But the one thing that I truly believe has to happen before anyone can make a huge life-affirming change for themselves? You have to decide you want it for YOURSELF. And you have to decide WHY you want it (hmmm...start with the old L'Oreal commercial "Because I'm WORTH it!" and work on really believing that line), and then YOU have to devise your own method, and what works in your case. 5. And make everything - the goal, the steps, the change statement - EVERYTHING as positive as you can! 7. Find folks who can be role models and cheerleaders and do your best to ignore those who are jealous of your goal or assure you you're "fine just the way you are" - they are either false friends or they're saying that because if you face your demons they might have to consider facing their own! It's the role models and cheerleaders who will be your lifelines when you're hanging by your fingernails. Who are mine? My WW leader Meghan, my Sis-In-Law and Big Sis, and then there's Tami and Jocelyn. Both Tami and Jocelyn were met in person at Sock Summit - Jocelyn I'd "known" longer online, but Tami and I struck up a conversation on the way to the SS09 Ravelry party and I was immediately impressed with her genuineness and commitment to her Pilates training. I didn't learn that night that she was a Weight Watchers leader. It was quite a bit later that she shared her story with me and inspired me to try Weight Watchers again - yes, I'd done it years ago, about the time I STARTED smoking to help me lose weight!!! (oh what a dummy I was, I should have stuck with WW and ditched the weed, but hindsight is 20-20, dontcha know). Jocelyn inspired me with her own success on WW, but also with her back issues. We had more in common than we knew! So find your best buddies, even if they're in real life, rather than online. Do whatever works for you...but remember it's not a snap decision, it's a process, and you have to think about it and plan, you have to devote some energy to it (goals, steps, action plans...), and that you will not always be perfect and that's just fine (because any "slip" can be fixed!). Then you have to honor a commitment to yourself just as strongly. And drop me a line. I'll be happy to cheerlead! I'm having a time with this one this week, as Ten on Tuesday is 10 Things You're Looking Forward to in 2010. I normally do a wrap-up post on the current year during this week, and then on January 1, I go into detail on my plans (remember, no resolutions!) for the New Year. I'm still planning to do that this week, so drop back by, okay? 1. A general upswing in the economy overall. Things have been looking better the past few months (ok, I realize the unemployment numbers aren't so peachy), but the signs of recovery are like the teensy green shoots of spring. I'm generally hopeful! 2. I'd love to begin to see improvement in the unemployment numbers, too, but I have watched this stuff long enough to know it lags behind everything else. That's not very comforting to those without jobs right now, or to those who are wishing they could find other work than what they have. But I am hopeful that as other things improve we'll see an uptick in new job creation or in hiring for vacant positions that remain unfilled. 3. Oddly enough, I'm one of those "old foggies" who is happy to see the increase in savings rate. I'd LOVE to continue to see folks pay down debt and increase their savings so they're not living so close to the edge! 5. While I'm on my mass transit kick, I'll also mention that I wish, how I wish, that once and for all, my community would recognize that a bus line that stops running at 8:30p.m. and doesn't run at all on Sundays is not a functional mass transit option. People who rely on bus service, often have to travel after 8:30 at night, because it's likely they work second or third shift, or even that they might like to stay in town after they get off work and have dinner! They also might like to attend church or other social functions on Sundays. And, to be really honest? They might want to go somewhere outside the city limits (into neighboring communities like Salem or Vinton) to shop - It would be nothing short of a miracle if the several communities in our surrounding area decided maybe they could work together on this. I'll suggest now that if you're a non-local you might be a little lost in this discussion right now (it has much to do with Virginia's Independent City & County tradition)... *wink* If you're a local? You probably think I'm really doing some pie-in-the-sky thinking - and I suspect you're right! 7. 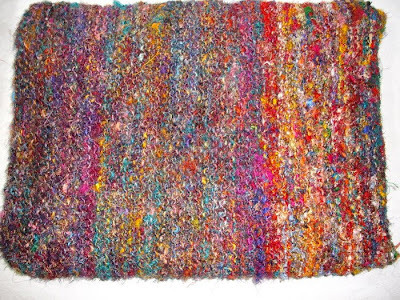 I'm looking forward to new knitting challenges in 2010 - you'll be hearing more about those come January 1 - there's so much left to try!! 8. 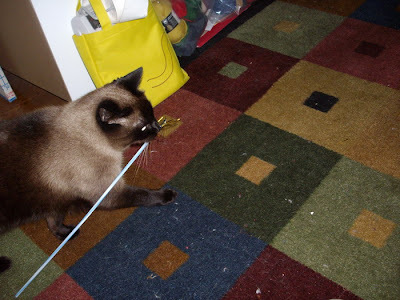 I'm looking forward to the Star City Cat Shows in January and July here in Roanoke, The Persian Society Cat Show in Richmond VA in April, the Sedalia Fiber Festival in May, and then the National Capital Cat Show in September up in Chantilly VA (DC). 9. Thinking about those shows and Nana Sadie Rose, I have a couple of new ideas on the drawing board, and I'm looking forward to getting those items into prototype and production! 10. As a mom and grandmother, I have to admit, that I'm always hopeful that the new year will bring good things for my family. Everyone struggles now and then, but the older generation looks back and sees things with 20-20 clarity. I wish that made it easier for the generation coming along behind. It doesn't. I can only hope that with each passing month, things get easier. That's what New Year's is all about: it's filled with potential and hope! Stay tuned - I'll see you soon...with more details, okay? 1. I'm feeling so much better, and cannot believe how much better my eye is! In one night's sleep? I don't think anyone who looks at me (unless they look closely and ask me to remove my glasses) would be able to tell. 2. I truly believe in the power of black tea - compresses and eye wash, as well as just plain good to drink! 4. I'm listening to a tape of my late brother's jazz piano...I'm so blessed to have a copy of this. So, even tho' I go back to work tomorrow, I'm thinking things are pretty good. 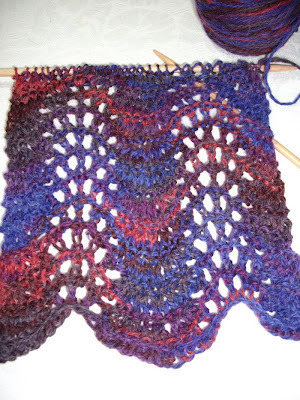 Heck, even the Feather and Fan scarf is going well, who can ask for better than that? I know I shouldn't do that. But this appears to be viral conjunctivitis and I'm about fit to be tied. Have no idea how long I'm not supposed to be around folks, but I am supposed to be at work on Monday. This began on Wednesday. Any nurses or doctors reading my blog, feel free to leave me a comment on routine behavior with this thing...I am better today...Christmas Eve had me looking fine, but tearing constantly from the one eye, yesterday was awful - swelling, red, tearing so badly it was like a gusher - today is somewhat itchy at times, but achy, too. The tearing is clear, tho, not indicating infection. But I look like I've got a small goose egg under my (much darker than normal) circle under my eye. I can feel a little nodule on my nose just beyond the corner of my eye. I've had much hot tea today. Used the teabags as compresses. Alternated hot and cold compresses, too. The skin under my eye looks like it belongs to someone 100 years old, not half that. I'll move along. I did make myself work on my office/knitting room today. I was looking back at my 2009 plans from last New Year's and discovered that it was one of those things I intended to do early on. Well...obviously time (and life) got away from me, so I'm coming back to it. I'll have photos (both before and after - I have no shame) to show you, but it's really only 1/2 done at this point. I hope to work a bit on it tomorrow, but we'll see...I have a couple of bags to make, too, and if I can see well enough to do it I should do that. Off to drink a bit more tea (decaf) before bedtime. (frankly? I think the candy canes were a bigger hit than the gifts!) 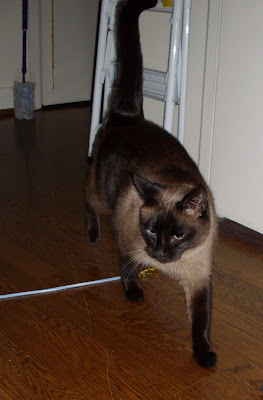 And yes, to those of you looking at that photo closely, DGS2 had a run-in with the TV cabinet last night at bedtime. He spent a bit of time in the ER and thanks to a speedy doc, who was aware of the impending ice storm, was treated quickly and sent home to get into bed before Santa arrived...he'll have a shiner for a bit, but thankfully, no stitches, just steri-strips! 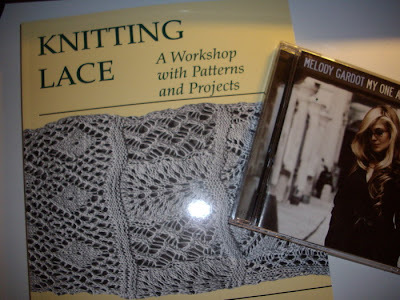 And I don't have to tell lace knitters about that book. Do I? Where did the week go? I hope everyone got their shopping done, and you're all safe and sound...this storm in the middle of the country sounds terrible, and we're bracing now for freezing rain late tonight into tomorrow...that's not as bad as the blizzard conditions west of here and we hope the electricity holds). But the ice will be on top of all the snow we got last weekend, so it won't be pretty. I've been fighting a sinus infection for about 2 weeks, and today it hit with a vengeance. Typical, huh? Sick for the holiday? Actually, for me, it's been a few years since this happened, so I suppose I should consider myself lucky. I used more stash yarn - the Red Heart Kids. 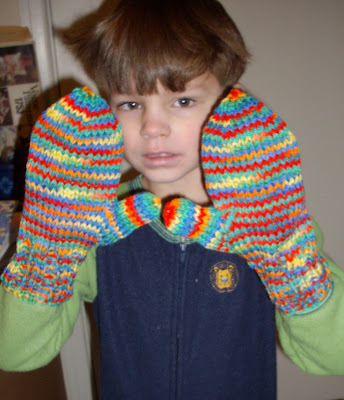 My only concern is that the smaller ones will be too small for the three year old. He's a big boy. But I knew the larger ones (for DGS2) would be fine, as he's a bit bigger than my eldest grandson, and my earlier set is too big for DGS1. So I think everything will be fine - and if they're not, the smaller ones will get donated and I'll make another pair for the littlest grandson. 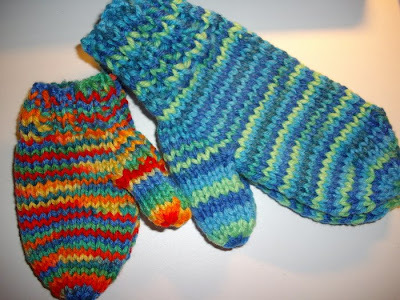 A bit of knitting detail: the larger pairs were knit on size 8 needles, and the smaller ones on size 5s. 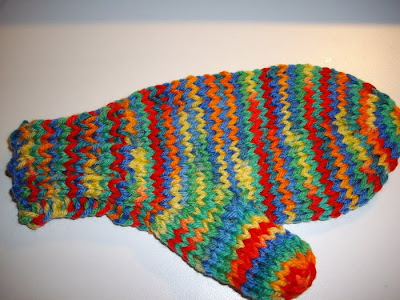 The pattern is Basic Mittens for Children which is a free pattern. 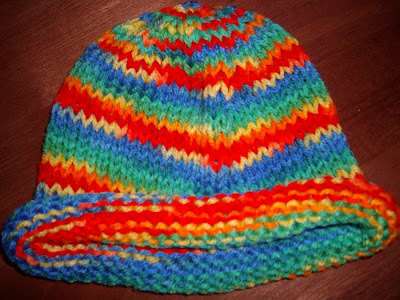 I'll be making some for our NoSoKnit during 2010, as these are amazingly easy and fast. The smaller pair? I made, start to finish, today. The blue/green pair I had on the needles yesterday at work, but since I didn't have a lot of time to knit yesterday, they were mostly done today. See what I mean? FAST. After all, Santa is coming and we don't want him to by-pass us because the lights are on, dontcha know? But we got OUT late this afternoon! Whoohoo! Work closed, as the secondary roads and residential streets were impassable, so we had a snow day. I've seen tons of Disney movies, and thank heaven for ABC Family Channel. We had lots of fun things to watch and did some crafts, too. But this isn't the way I'd have preferred to spend an unexpected long weekend. This time? 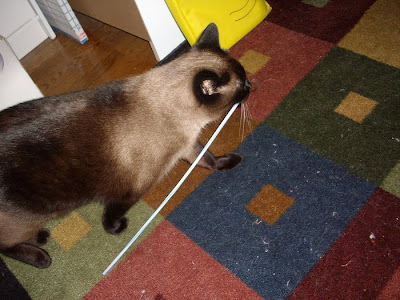 I got a little fed up with her and tossed it into the hallway (onto the hardwood floor) - Plink! 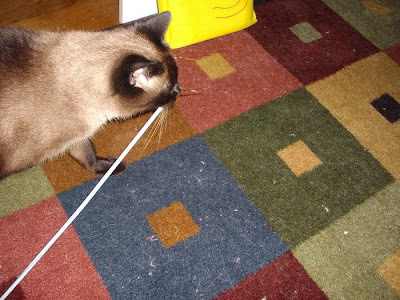 A prime example of why many people think of the Siamese as the most "doglike" of all cats...shall we have a game of fetch? When I discovered this? I realized I was doomed. Do you think I have enough time? It a very cold and breezy day, but it's a brilliant sun-shiney one. 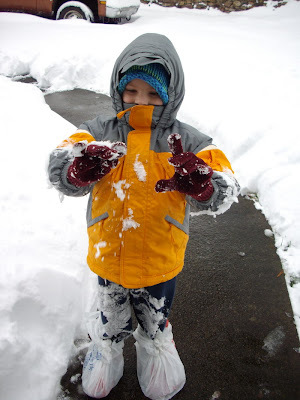 We've stayed in, the grandson is a might stuffy, which could be allergies, as he doesn't appear sick, but I am sore enough from yesterday's exertions to think it wise to keep ourselves indoors. My neighbor (did I mention they're really terrific people?) loaned us several Disney VCR tapes, and we've had a marathon of cartoon stories today, along with making paper snowflakes! I'm amazed that it only took 24 hours to make the two. 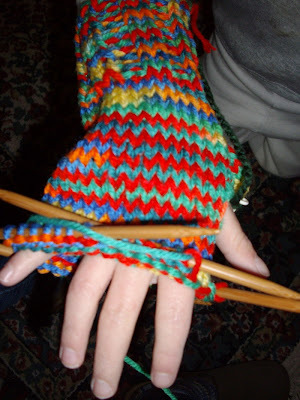 I'll join BK and say I wish I could knit socks that fast. And finished it while we watched the movies. 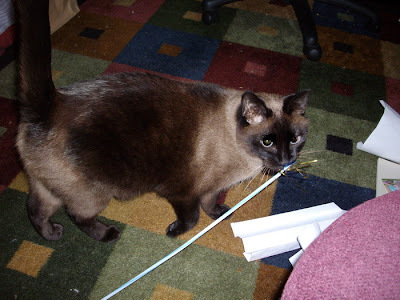 Throughout the weekend, we've seen very little of The Meezer (except after the grandson goes to bed, then she feels safe enough to venture out). 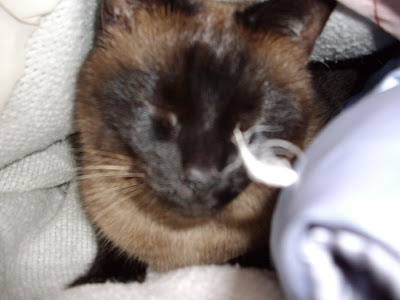 I even enjoy 'niffin' those occasional duck feathers, Mom, now please, put the covers down and don't give my hide-y-hole away? And can't say I'm unhappy with the total. 22 inches was almost too much to comprehend anyway. Yes. This is what greeted me. Hmm...elves? Nope. 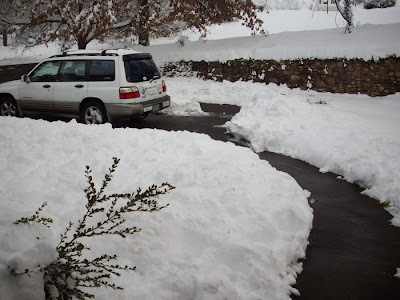 I have the best neighbors in the world - they'd cleared my walk and were working on the driveway (which is most of the front yard). It took two seconds for me to snap this photo - literally, he jumped out the door and into the snow! Please note the latest in this season's fashion boots? Grocery store plastic sacks tied and rubber banded over tennis shoes...They were semi-functional, and it wasn't too long (maybe we were out an hour, helping to clear away the snow) but very suddenly he said he was cold. And he was - and wet, too, straight through. We were at this stage before lunch. He's very impressed with the whole process. Yes, they're a little big, but I figured better that than to outgrow them this year! He does take after his Nana, after all! I'll do my best to keep the blog updated on this record-breaking storm. The local news gave a quick rundown on our "record" snows: 1969, 1983, 1993, 1996 - the last of which was the year my mom died and I well remember (as does Big Sis!) that snowstorm that stranded her here in Roanoke (fortunately at the time, the NOVA schools were closed so she didn't lose time from her teaching job in Fairfax County). We couldn't even get off my mom's street until Wednesday - the snow fell on Saturday-Sunday. That photo is at 11 p.m. When I watched the news a few minutes later they said Roanoke had 9.5 inches at that point! It's supposed to be 1-2 inches per hour at times overnight with possible thundersnow. My DGS has no mittens, so you know what I'm up to right? We're smack dab in the middle of that purple, if you didn't know. Locally, we're being told that the snow totals could climb as high as 19 inches. I probably don't have to tell you that this area, because we don't get a lot of snow, isn't well prepared to deal with it. At present the plan is for me to keep my eldest grandson (yes, they're back home, long story, too long for the blog, but they're back)...so I'm kinda hoping we can get out and play a little (I'll try to do photos!). And there's a slow cooker full of a Mexicali chicken stew bubbling away at my house today, so I think we can eat decently! Oh. And I might be able to knit, too, but we'll see how that goes...just the one last Christmas project OTN, I'd like to finish it. By the way...did you happen to see this? Roxanne and Anne teamed up and that's one smashing kit they're showing! Hmm...wonder if there'll be any Christmas gift money I might put towards that? I guess time will tell!! Oh My! We Are A Rowdy Bunch of Gals! Christmas 2009 at the Ravishing Reds of Roanoke! And as I walked into WW, I happened to look into the salon next door to see my cardiologist waiting patiently for his wife. I went in and reported to him my weight loss results...poor man, he sees me once a year, and without the chart in front of him looked a tad bit bewildered! I assured him I realized he wasn't connecting me to the patient he sees, but that I'd be in soon for a checkup - so far 17 pounds lighter. He shook my hand, grinned and said, "Congratulations! Keep up the good work" and we wished each other Merry Christmas...He might have started out the brief encounter in a fog, but I suspect he was totally genuine once it kicked in that he was seeing a successful heart patient! So anyway I kinda celebrated at dinner tonight. As I said, I rarely go to this restaurant and it's my favorite place. I enjoyed prime rib, but only 1/2 what I normally would have, a baked potato (with Molly McButter! ), and a salad with fat free vinegrette on the side - oh...it was a sesame vinegrette, and very very good!). No bread, but I did have a second glass of merlot - my one real "excess." Our Queen Mum, Joyce, is retiring but staying with the group. In our conversation we discovered that she, like me, will be family-less on Christmas day, so we have decided we're not staying home but we're going to plan something - probably a movie, not sure what else. Whatever we end up doing I know we'll have fun! Interestingly? I think Mr. Darcy is lovely - and even tho' it's a "man's" sweater, I'd be willing to try to make it for me! Wow. And I already thought my queue was long enough? 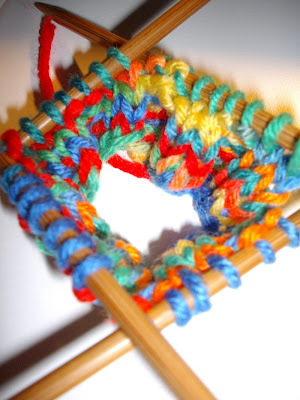 It's that boring time of year for a knitting blog: the Christmas gifts are in process and you know it's entirely possible that the recipient could happen to see what you're working on if you post about it. Suffice to say, I'm making progress. 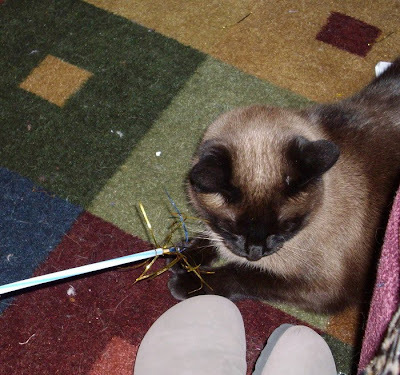 Yesterday I had Christmas with my daughter's family (yes, they left today for parts south), and then I also had to do my client's books, too, over this weekend, so it left very little time for knitting. But the last gift is OTN and moving along. Oh, and I also made a WW friendly pizza tonight, which you can see over on Nana Sadie's Place, but be prepared...it got a touch overdone! It's been super cold again. We got an icy mix overnight, but by mid-morning it had turned over to just a cold rain...and by this evening the sun was peeking through. Can you believe they're saying it will be 60 tomorrow? That's the sort of craziness we have around these parts. Today, I decided to try something my mom taught me 30 years ago: lining the window with heavy plastic, taped along the moulding. Overtop, of course, are the thermal drapes that I haven't been terribly happy with, since you get what you pay for, and these were of the more inexpensive persuasion!. But it shouldn't surprise me that the air come down UNDER the bottom of the drape right onto my legs. I think the plastic and tape are working to minimize that, at least. Obviously, it's not a solution for any window you want to have open to the light. But I keep both of these windows covered so that my ocular migraines don't hit when I'm working. 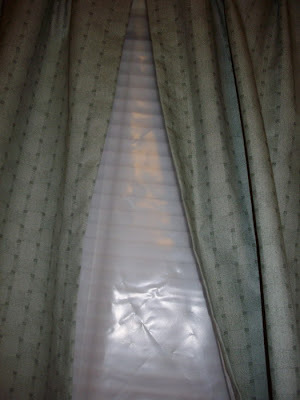 It will probably be the end of the week before I can put the plastic on the window behind the sewing table. 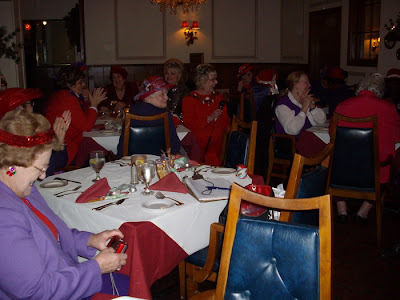 Monday is yoga, Tuesday is the Red Hats' Christmas dinner. Perhaps on Wednesday night - which is just when the temps are supposed to edge back down again! Join up on his son's Facebook Page, add a comment about your experience, or that of a loved one, with smoking related issues. When there are 1,000,000 members of the group, John has told his son he'll quit. This is one week I'm happier than I've been in a long time to see come to an end. They're nice folks, don't get me wrong, but I am always glad when the angonizing "On Stage, Under the Microscope" part of my job is over. So tonight, I'm tired. Tomorrow is my first of at least a couple of Christmases - this one with my daughter's family. I felt as if I weren't doing right by my grandsons, as I made them nothing this year. 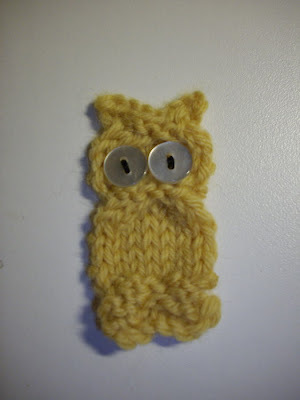 But in surfing Ravelry's patterns earlier, I discovered a darling trifle: Hoot by Ysolda. I may have to make a flock of them for myself. Easy. Peasy. Just the sort of quickie project that makes me feel as if I accomplished something...when I felt like not trying to accomplish a thing. I hope, if you're shopping for the holidays this weekend, that you have clear sailing, fair weather, and great prices. I'm in a state of disbelief that I'm essentially done (okay, I should knit one more pair of socks, and locate one or two more "guy" gifts). It's December 11. That's just totally out of character for me! I've been a bit lucky in the midst of my annual financial audit that our Consumer Christmas Party fell in the middle of the week. The auditors knew we wouldn't be in so didn't bother to come in either. Off we went and a good time was had by all...it's a lot of work, tho' and when lunch and Bingo are over, we trundle everything back to the office and close 'er down for the rest of the day. So I went off to do a bit of Christmas shopping. We'll be having an earlier event with my daughter's family because they're heading out of town to spend the school break with his family, so I had less time to get their stuff together and organized. I think I'm together on it tho'. Whew! 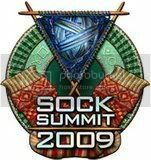 And during the party I was able to work on my PSC November socks and completed them during the news tonight. Um. If anyone reading the blog thought that I might back down and say, oh, well, these socks will be a gift? The answer is no. They're mine. I didn't even put them on the sock blockers to show them off...These are wonderful! 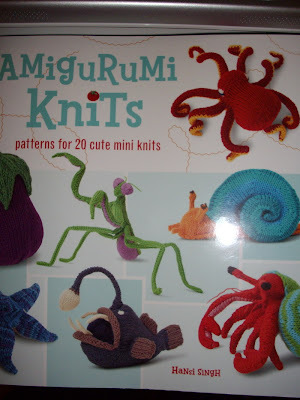 So now I have to dig thru stash to find another pair to knit for the gift. Ten on Tuesday this week has me pushing it to come up with the things I love about the holidays. I have mixed feelings about this time of year, because expectations are so high and usually aren’t met. I’ve worked for a good many years to lower mine and feel pretty comfortable with where I am, but again and again I see folks set themselves up for a fall. 1. 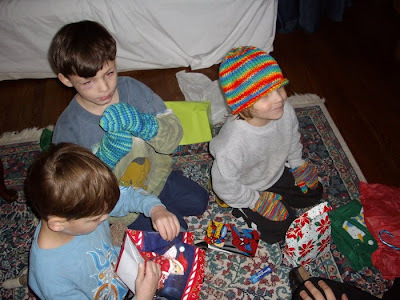 My grandsons’ sense of wonderment – tho’ I worry that they’re entirely too acquisitive – they still have that child-like amazement about everything related to Christmas. 2. Single white candles in each window of a house – that’s my favorite lighting display. 3. White poinsettias on beds of pine boughs (with pinecones attached). 4. 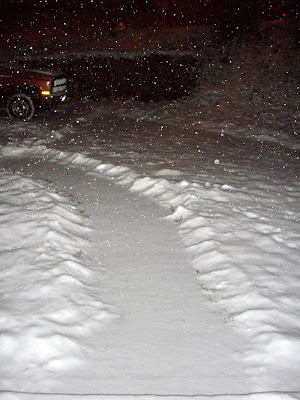 Snow – ok, not a frequent occurrence here, but still, when it happens, it’s magickal. 5. Our extended family gathering which never happens ON the 25th. 6. My favorite personal decorations: my ceramic tree with my Dad’s handcrafted red wooden sleigh with Rodney Reindeer sitting inside. 7. Windham Hill’s entire series of Winter Solstice CDs. 8. 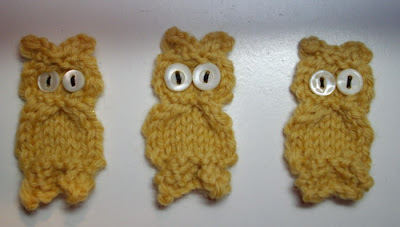 Making gifts that are totally not expected – one year it was sock monkeys for the boys, this year it’s something totally different from my normal craft pursuits. 9. Holiday concerts – orchestral, choral. 10. Christmas movies – at home, with popcorn and lots of knitting. That’s it. My list of 10 Favorite Things about Christmas. What’s yours? FO!! 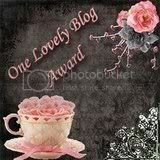 And It's a Bloggable One!! Wow! And this close to Christmas, what do you know? 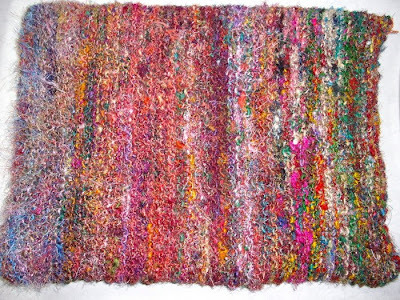 I finished the Recycled Sari Silk Yoga cushion last night...and took both pieces downstairs, hoping that the lightbulb would go off before I finished sewing in the zipper and I'd think of something to use as cushioning inside the pillowcase. I had no proper pillow forms that would meet the size requirement, and I had thought of cannablizing a ready-made one, but realized that it the one I had was really too square and I'd have to remake the form! Not quite what I had in mind...and as I was looking at it, I thought, "well that's too poofy, anyway, I want a cushion not a pillow! I took my time sewing in the zipper I found - a brilliant orange thing from years ago when I scavanged the bins of this one sewing store during one of the multiple times it went out of business (over the years it had 3 or 4 names, but always reopened after failing and filing for bankruptcy. When the finally closed this last time, it was, indeed for good, I guess). So I got busy and I proceeded to do a horrid job of sewing the zipper in, and then an equally bad job of sewing the three side seams together. When I was done, it was definitely time for the lightbulb to go on. I stood up and scanned the sewing room...what could I use to stuff this cushion? On the top of one 6-foot shelf of fabrics there stands a 15 yard bolt of batting that I ordered from a new supplier 3 years ago. It arrived and I'm really surprised you couldn't hear my "arrrrrrghhhhh" of agonized distress all the way to where you are. The entire bolt was substandard, but this group is a "sales final" kinda spot. I was stuck. Over the years, I've tried to work around it, figuring where it will work and where not. Mostly it's sat on top of the shelf unit. Well. I pulled it down, and cut multiple layers of it, folded it inside the case and viola! a couple of inches deep, not a poofy, sinking kind of cushion, but one that's soft and mostly flat. Perfect. 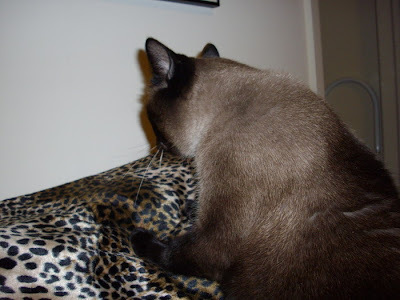 And I'd no sooner set the cushion down to photo, than The Meezer jumped into the shot. She has taken over the cushion now. But yoga is tonight. I wonder who'll win? It Snowed ... And It's COLD! Surprise! 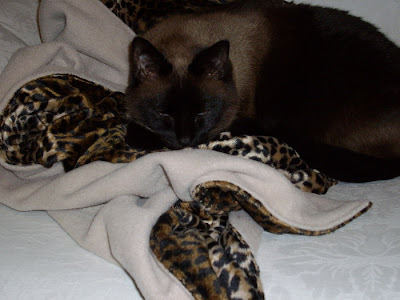 I turned around from the computer tonight to discover that The Meezer has changed her mind about the faux leopard throw! I won't risk heading up that mountain in the snow - or for that matter being UP there when it hits. I've had such experiences before, as I used to commute to Tech, rain or shine every day. I remember getting to school one winter day when it was just cloudy and overcast in Roanoke, only to find that the snow was coming down in buckets at the top of the mountain, and by the time I got to campus, it was pushing it to see, let alone drive. And after I got to school, after I parked and went in, they actually cancelled night classes (unheard of!) 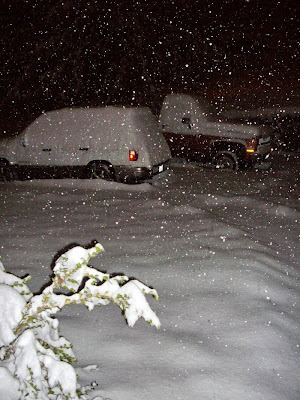 and I had to drive BACK down the mountain in that stuff and it was scary, really scary. By the time I got home, it was just raining! My Mom made sure I knew how to drive in snow, teaching me in Vermont whenever we were there. 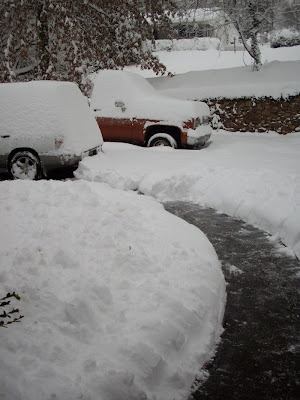 (They get a lot of snow and we made trips up at various times of the year when family became elderly and ill). So it's not that I don't know how to drive in snow. But I-81 isn't for sissies in good weather, so when it's bad, I just don't. 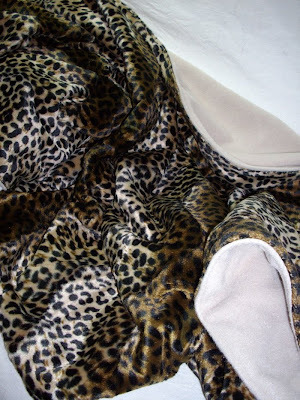 It's all acrylic - a plush faux leopard and then a second layer of beige fleece. It's one of those serendipitous finds, that was just on the remnant table and cost next to nothing. 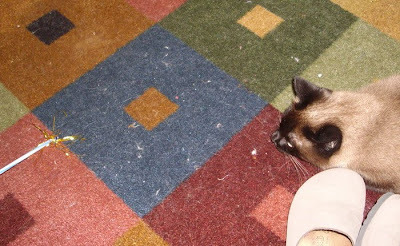 It's really warm, but The Meezer won't go near it! 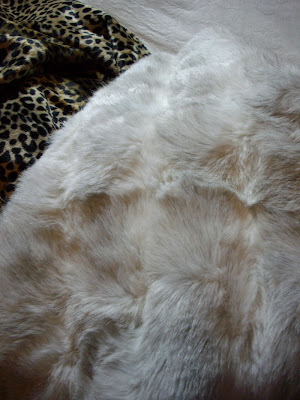 A very vintage faux chinchilla remnant. I'm trying to decide what to line it with. 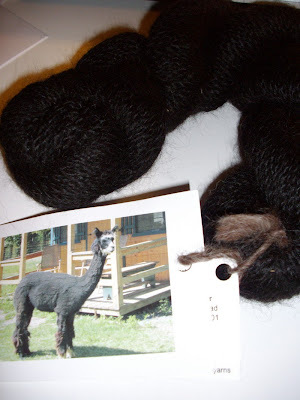 The picture is of Mercedes, the alpaca who grew this fluff at Kenly Hill Alpacas. 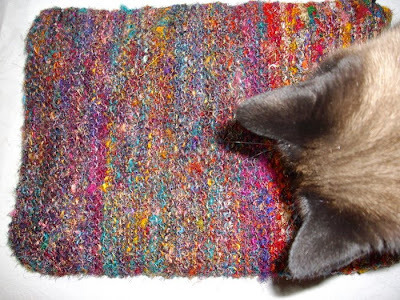 It's so soft and warm...I think it will make a nice pair of mitts, don't you? My lamb collection is growing! 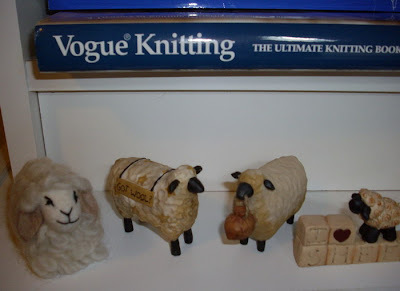 (I even have 2 knitted lamb ornaments that I use on my Christmas tree which I think I'll pull out and keep with this crew. They'll be more comfortable with "their own kind" don't you think? Saturday is the Three Bags Full charity knitting event in Blacksburg, sponsored by Mosaic Yarn Shop. We're planning to drive up, KnitIntegrity and I, but I'm hearing now that there might be snow on Saturday with "light accumulations." Since Blacksburg is on top of a mountain (a plateau really) it can get bad up there quickly. I love my Forester, but I'm not sure we'll push it, if the snow starts coming down. But I've got my fingers crossed it holds off for most of the day - we need to knit a hat for the charity while we're there!! So think warm thoughts for us, okay? SEE? I do have a wishlist! 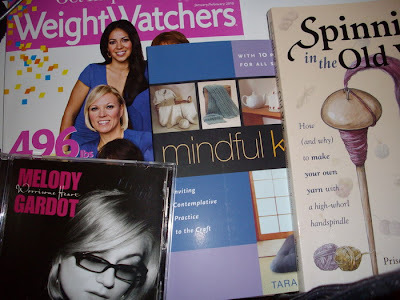 The other thing on my wishlist is in process: the rest of my weight loss! See the ticker? Yes, I'm at 13 pounds lost, and while some people think the number thirteen is unlucky? I'm pretty happy with that number right now. That's the second side of the Recycled Sari Silk Yoga Pillow - and those two balls on top are the third skein of silk. 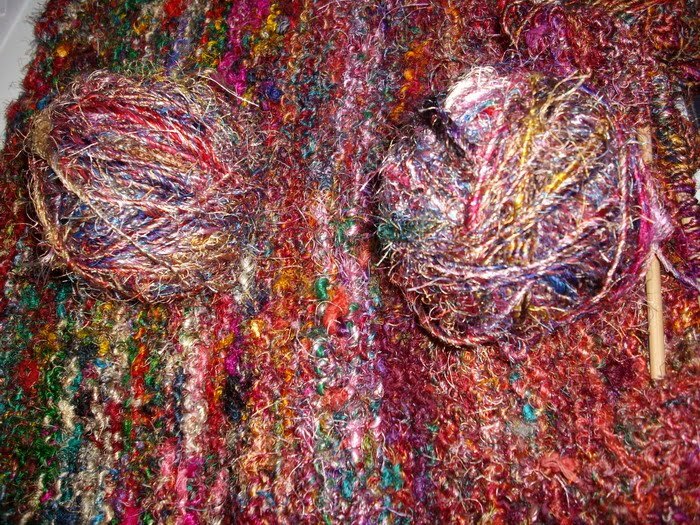 Interesting how lopsided the volume of yarn is in these skeins...and this particular one is hairy-er. I'll be glad when it's finished. But then? 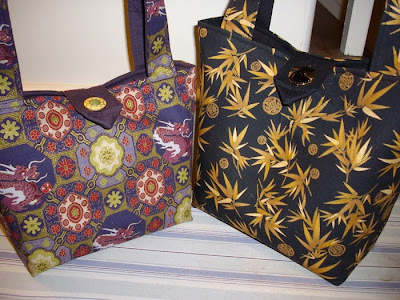 I'm kinda thinking I'm going on with using up more and more of my stash - I've got some heavy silks and cottons that are odd amounts, and hmm...maybe I'll put together an oddly constructed shopping tote from them - waste not, want not, right? Maybe I'll make 2010 my "Use It Up" year? That's not to say I won't buy more yarn during the year. I can't ever swear off my yarn (or fabric, either, for that matter) purchases for any serious length of time, but it would be nice to use some up to make room for the new, right? Just a thought here at the beginning of December and the middle of the week. Let's see how I feel come month-end, okay? What are you thinking about for 2010? Or have you made it that far yet? This week's Ten on Tuesday is asking me to tell you ten things I really want but wouldn't buy for myself. Hmmm...IF I want it, I'll buy it and even if I can't afford whatever *it* is right now, if it's something I truly want, I will save up for it...So this particular week's assignment just doesn't apply to me. I'll be back soon with something more or less interesting to talk about!